I’m 50yo, male, in good health, good weight, good mobility. I had right hip arthroscopy last July 2018 for cam FAI, cleanup and smoothing of femoral head, and labrum (no tear), basically I could not sit cross legged any more and internal hip rotation was zero and painful. I now have numbness in my buttock, tingling in my thigh muscle and numbness which moves around knee, calf, arch and sometimes over the foot, it can change on a daily basis from nothing to very annoying. I’m doing exercise to help L4L5 area in case it is there, doing stretching and rolling on piriformis - but if it is caused by the surgery (maybe the portals etc) I wondered what I can do? The surgeon has been asked 3 times and just keeps saying either do more exercise or less, which has not been well received! I’m also seeing a sport massage for trigger points in glutes etc. I think it true to say that after 7 months, not much further improvement is likely without intervention. As a matter of interest, has internal rotation improved, and is it less painful? Can you put your leg into the lotus position, known as Patrick's Fabere? As a Chiropractor I would try to assess what nerve has been damaged by the surgery, and to this end, nerve conduction tests done by a neurologist would help. Is the problem in a nerve root in your back (unlikely), in the sciatic nerve as it emerges from notch in your buttock together with the piriformis, or in the femoral nerve, or one of its slips. 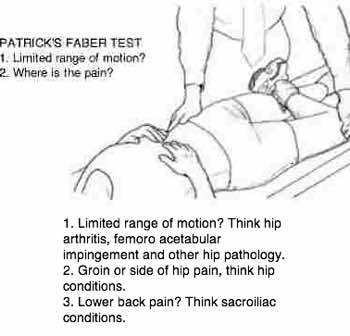 Then the next question is whether the sacroiliac joint has been affected, and this is likely, even before the surgery, and whether treatment of the SIJ would help. Next would be to establish whether reflexes have been affected and by doing 'leg pain muscle testing' - which you could do at home, by entering this into the Site Search at the top of the Navigation Bar on the left of your screen. You could also us a sharp needle to map out the exact area affected by the numbness and tingling, and whether it's sharper, duller or actually no change, just tingly. Then are the sciatic or femoral nerve stretches positive? If you bend forwards, backwards and to the side does it do anything unusual anywhere? Depending on what is found from the above, your chiropractor would then decide whether he could help you, or if it's unlikely. I'm obviously uncertain, though if you could give me answers to the above, then I could perhaps give an indication. Do you have before and after x-rays? That would help. Send them to brlewisatmwebdotcodotza Perhaps start with that and having an evaluation from a neurologist. Good luck, I look forward to hearing further from you. One last thing; as I understand it, that CAM deformity will regrow, particularly if you don't exercise the joint daily; I would ask the surgeon's opinion, and what exercises to do. I hope this contributes. Precise answers to all of the above are essential if you want me to add anything further; most of it you could do yourself, except for the reflexes, stretch tests and nerve conduction tests, all of which the neurologist could provide. Perhaps print this and take it with you to him or her.